The fire started around 5 a.m. at the Goodwill warehouse in the 800 block of Industrial Way. No employees were at the location when the fire broke out. Firefighters contained the blaze to a few storage containers. No one suffered any injuries, and the damage is expected to be minimal. 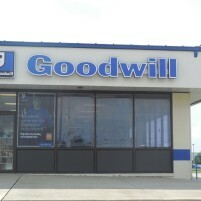 Goodwill will be open for business Tuesday. The fire started around 4:30am or so… 911 was called at 5:17am and by 5:30am the blaze was mostly contained. The response time was quick, SLO PD, sherriff and SLO FD showed up. Followed by Cal Fire and an ambulance (which, thankfully, was not needed). I was really impressed that there were several cars driving by and not even slowing or noticing the blaze. It was only after a series of loud bangs (something exploding) that I bothered to see what was up and call it in. taxpayers got some value for the quarter million a year firemen in saving our discarded junk. Good job guys! So the photographer couldn’t be bothered to drive an extra 3 or 4 miles to take a picture of the actual warehouse that caught on fire? Do you want to pay a buck every time you come to this site? Maybe then you’d have a gripe. Are Google Map images protected? (if my html is coded correctly). Thanks for the photo. Those flames were more than I expected based on the story. I sure hope they catch the fire bug lighting all these fires around Slo. At some point the person will up it to cars and/or homes. Does the CEO make to much money, yeah probably, but there is a bigger problem and that is who is setting the fires. So go ahead and joke about this while a very sick person proceeds to light fire after fire. Is there going to be a fire sale? I could go Good Will Hunting. phew……thk god the damage is minimal…..operations will be able to continue contributing to the CEO’s $2M a year salary. That salary is some goodwill. Maybe Goodwill’s CEO is just trying to keep up with public sector administrators, managers, supervisors and such? talk about screwing people over who are at the most vulnerable level in society. Take donations from public, pay ex cons minimum, and pay yourself $2M a year. Dee Torres is trying to replicate this “non profit” model. Soon she’ll have to support Adumb. It’s the government way, United Way does it, Susan G. Komen foundation does it and there are plenty more.